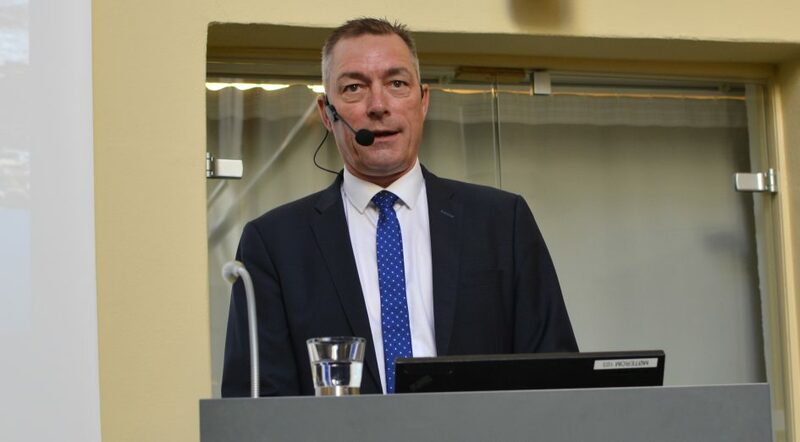 Minister of defence, Norway, Frank Bakke-Jensen was the keynote speaker at the IFS-conference on Joint Expeditionary Force in Oslo today. He opened the conference by welcoming the participating friends, included Generals and Admirals and said “…I hope you will use this occasion to get a better understanding of the Joint Expeditionary Force”. – Our security environment is changing rapidly. It is both dynamic and complex. Threats present themselves across domains. They do so at the same time, from different geographical directions. We need to be able to respond rapidly and effectively. Both to deter potential adversaries – and to support international stability. In this environment, we need NATO – and Allied unity – more than ever. However, we also need additional frameworks. Frameworks to supplement NATO when crises does occur. 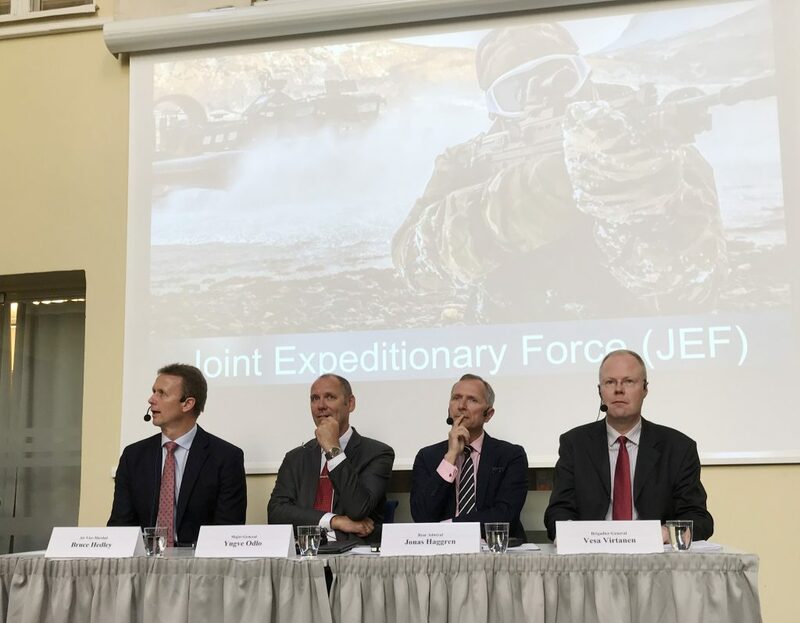 The UK-led Joint Expeditionary Force, the “JEF”, is a valuable initiative in this regard. The JEF will increase our ability to respond to crises. This includes our ability to respond to crisis in our own region.I therefore highly appreciate the UK leadership of JEF. Norway is pleased to have been part of the multinational JEF since its start in 2014. JEF is a true NATO initiative, but with regional participation. NATO’s Framework Nation Concept lets one larger ally take lead to coordinate smaller nations. The aim being to increase NATO’s abilities – in a range of areas. By utilising capabilities from several nations, that otherwise may have been left out. Germany took the lead for a project on capability development. While the UK-led JEF is based on operational cooperation. The JEF represents additional collaboration between like-minded nations in our region. That makes the JEF even more important for Norway. It brings countries with both NATO and EU affiliations together. Such as our neighbours Denmark, Sweden and Finland. As well as other Northern European NATO allies. We can use the Joint Expeditionary Force in operations of virtually any type. Be it humanitarian assistance, evacuation, peace-support or combat operations. An example is operation GRITROCK in 2014. While this happened before the formal declaration of JEF, it was a true JEF operation in concept. GRITROCK was a response to the severe Ebola outbreak in Sierra Leone. The UK, Norway, The Netherlands and Denmark worked together to handle the crisis. – The foundation is a stated political will to cooperate in a crisis. – The second is available forces from JEF nations who are trained to operate together. – Lastly, a framework between the nations. A framework that allows for the smooth integration of forces – a kind of “Plug and Play”. Together with my fellow JEF Defence Ministers, I will sign the final framework agreement in London late this June. A key strength of JEF is that the cooperation is based on NATO standards and procedures. Another key issue is that the forces exercise and train together. The Joint Expeditionary Force utilises opportunities to train during already scheduled exercises. For instance, Norwegian and other JEF forces were recently in Scotland during exercise Joint Warrior. The Joint Expeditionary Force is not a standing force. A JEF operation or mission will be designed to fit the task. That means that each JEF nation will decide after a specific request, whether or not it will participate. The partner nation then decides which forces it will be able to contribute to the operation. Be it a field hospital, transport and logistics or combat units. Britain, as the Framework Nation, takes the leading role in the coalition. This enables Norway, as a small nation, to participate with niche capabilities. These capabilities may be critical in certain situations. This could be naval, air, or other assets available on short notice. The Joint Expeditionary Force gives small countries opportunities. Opportunities to contribute to crisis management quickly – and with greater impact than if we were alone. When a situation occurs, Britain will ask JEF nations for possible contributions. Each partner nation will decide individually whether to participate or not. But, the UK may also activate a JEF deployment with UK forces only. This is also part of the flexibility and strength of the JEF cooperation. The Joint Expeditionary Force is international by design. With NATO concepts and standards as the bedrock for interoperability. However, it is important for me to repeat and underline that JEF is not in competition with other international organizations. It is designed to complement, and if necessary support, organizations such as the UN, EU or NATO. It is also designed to form part of a larger NATO operation – in various ways. Again, the concept is one of “Plug-and-Play”. The Joint Expeditionary Force represents a new contribution to European crisis management. Across nations with a similar outlook. Maximizing efficiencies, while maintaining national sovereignty. Which is key to making it work. It is also key to making the Joint Expeditionary Force a force to be reckoned with. I hope that this cooperation will benefit us in several ways going forward: I hope the JEF will further increase our ability to work together. And to serve as a test-bed for innovation and development. But most importantly, I expect the Joint Expeditionary Force to be a useful new tool in the political toolbox. A tool that provides us with an increased ability to manage crisis. Finally, I would like to underscore another important aspect: JEF’s role in deterrence and defence. The cooperation in the JEF, using NATO protocols, increases the credibility of our forces. Not only for low-intensity scenarios, but for high-end crisis as well. This sends a strong signal to any potential adversary. We are ready to ensure the safety of our people and the security of our nations. Even in the face of an ever-changing international security environment.